This elegant new design uses the configuration first exploited in the prestige Neat Ultimatum XL6 loudspeaker. The top section is sealed off from the lower, and incorporates two sealed chambers, operating as a two-way infinite baffle loudspeaker. 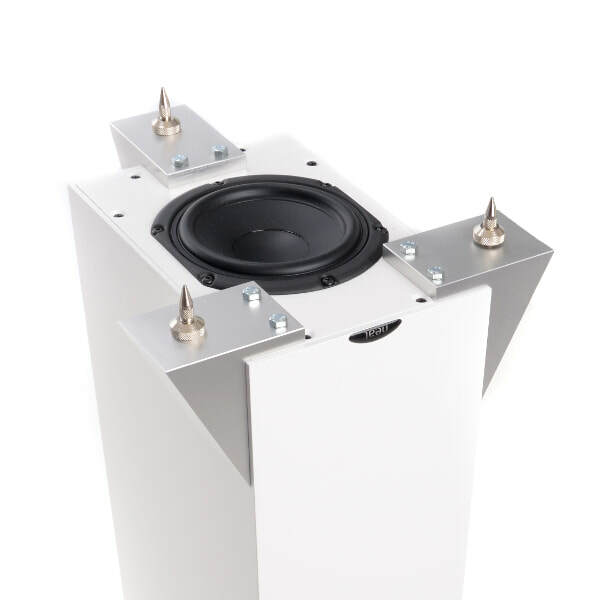 A 50mm ribbon-type tweeter and 134mm bass/midrange unit are both mounted on a specially profiled sub-baffle, attached to the main cabinet via a de-coupling polyethylene membrane. The tweeter is a ribbon type which delivers tremendous dynamic expression without compression. The bass/mid drive unit has also been used in the award-winning Neat Motive and Iota Alpha models. It has a treated paper cone with a flared profile. The carefully-judged crossover network allows superb integration of these units. The lower, ported, section of the EKSTRA houses not one, but two of the 134mm bass drive units. One unit is located on the bottom panel, facing the floor, whilst the second is located internally, directly above the first, in a sealed iso-baric arrangement, handling only low frequencies and acting as an integral subwoofer system. The low-Q port is specially tuned to enable close to wall placement of the speaker in most rooms. Drive units: 1x 134mm LF/Midrange unit; 1x Ribbon HF unit; 2x 134mm LF units.